Animals fill an important spot in our hearts and when they are gone, they leave us feeling sad and empty. 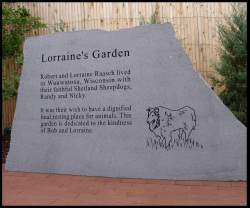 Lorraine’s Garden, located at the Wisconsin Humane Society, is a final resting place that honors the affection and joy that our precious companions play in our lives. This lovely setting includes a Meditation Garden and outdoor Chapel, a Memory Walk and a Columbarium to inter your companion’s remains. 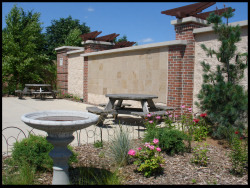 For those who purchase a niche in Lorraine’s Garden, the Wisconsin Humane Society offers private cremation services for your companion animal under the caring supervision of compassionate veterinary staff. The cremation takes place at the Wisconsin Humane Society in our state of the art facility. Private remains are sealed and placed in a special container and returned to you with a certificate of cremation. 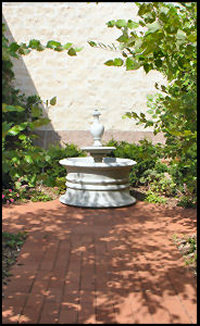 Lorraine’s Garden provides a respectful way for you to acknowledge the importance of the bond between you and your beloved animal. Your animal’s remains will be treated with care and placed in a sealed container in his or her own niche in one of the Columbarium Garden walls. A granite plaque engraved with your message in his or her memory will cap the outside wall. We can help you to make all of the required decisions, including whether you wish to have a small memorial service for close family and friends for the internment. You may also consider adjoining multiple vaults to keep your animal family together. Providing a memorial gift to honor a loved one helps abandoned animals at the Wisconsin Humane Society. Memorial donation for a person or animal. Personalized tribute to a person or animal on a brick on the Memory Walk. Naming opportunities for items like the benches and statuary. Lorraine Raasch understood the profound bond between people and their companion animals and left resources in her estate for the Wisconsin Humane Society to create a special place like our Memorial Garden. As a lover of Shetland Sheepdogs, Lorraine kept animals in her heart to the end of her life and we are proud to dedicate this garden in her name. Fees start at just $600 for each 12" x 12" granite niche. If you are interested in learning more about Lorraine’s Garden, please fill out a request form to receive information or call us directly at 414-431-6270. To fill out a Lorraine's Garden Pre-Planning Form, click here. If you are interested in learning more about Lorraine’s Garden, please fill out a request form to receive information or call us directly at 414-431-6270.